Research into the mechanisms driving drought-related plant mortality has seen a focussed effort in recent years. Drought and water availability are pervasive factors influencing the distribution of forests and woodlands globally, particularly in water-limited environments, where evaporation exceeds rainfall and is therefore a major constraint on productivity. However, the lack of a predictive framework for forest mortality remains an important knowledge gap in ecosystem and biogeochemical models (Roxburgh et al., 2004). The paper by Hartmann et al. (pp. 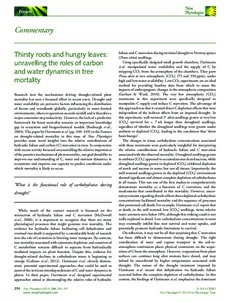 340�9) in the Feature on drought-related mortality in this issue of New Phytologist provides some novel insights into the relative contributions of hydraulic failure and carbon (C) starvation in trees. In conjunction with recent activity focussed on unravelling the relative importance of the putative mechanisms of plant mortality, our goal should be to improve our understanding of C, water and nutrient dynamics in ecosystems and improve our capacity to predict conditions under which mortality is likely to occur.